As part of his three-day apostolic journey to Georgia and Azerbaijan, Pope Francis met with priests, religious, seminarians, and pastoral workers following Mass on Saturday, October 1. A seminarian at the meeting gave his testimony to the Holy Father, speaking of the encouragement he received from his mother at a young age to pursue the priesthood. Pope Francis spoke of the importance of strong faith within the family structure, which involves “the capacity to receive faith from others, to conserve that faith, and to pass it on.” This faith is like a plant: “the faith without the roots of a mother and grandmother does not grow.” The faith that is passed on from parents to children is what helps the Church to grow. The Holy Father also listened to the testimony of Irina, a Georgian wife and mother, who expressed some of the difficulties particular to family life in Georgia, including the ease of obtaining a divorce and the trouble in finding good Christian education for children. “Marriage is the most beautiful thing that God has created,” the pope said in response. A married couple reflects God’s love and His image because they become one flesh. But this “image of God is soiled” through divorce, which often harms can affect children more than anyone else. Pope Francis then gave ways to help couples in the Church, through “offering welcome, closeness, accompaniment, discernment, and integration into the Body of the Church.” It is of great importance that those in the Church work to save marriages. For couples, he gave three words, “words of gold in married life,” to aid in building up a marriage: “can I?” (in regards to asking their spouse’s opinion), “thank you,” and “forgive me.” He encouraged married couples to quickly make peace with each other when arguments arise, and to remember his three words, which are crucial for marital growth. In addition to divorce, the Holy Father mentioned another threat to marriage today, that of gender theory, which seeks to redefine masculinity and femininity. The effects on marriage are profound. 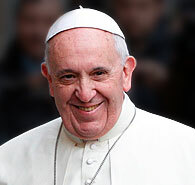 “There is a world war to destroy marriage…not with weapons, but with ideas,” the pope said. To defend this sacrament, we must be on guard against these ideologies in the Church and society, whether we are married or unmarried. Join us in reading through chapter 4 of Pope Francis's post-synodal exhortation Amoris Laetitia (The Joy of Love).